Notes on Salma Ahmad Caller’s process for the making of ‘Den of Sibyl Wren’. The Den of Sibyl Wren is my response to A Hierarchy of Halls (forthcoming, Smithereens Press, 2018) by Christine Murray. It is my response to words Chris wrote about how she feels about this poem, and what she sees in her mind’s eye. My process involves an intense working back and forth with words and images in my imagination. I write a lot as part of my creative process as an artist, and these writings help me create and develop the visual image. The so-called ‘visual’ image is to me embodied, materialised, haptic and tactile. 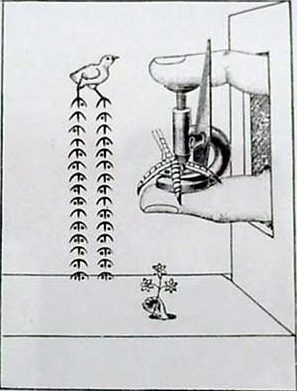 So the ‘image’ in poetry and metaphorical writing is almost the same as the visual image in art, to me. So there is not a huge gap between text and image. Not in my mind in any case. The flat 2 D image is neither flat nor 2 D – but rather it is a complex and multi-dimensional terrain of emotion, sensation and concept, just as is the written word, especially in poetry. So it felt very natural to respond to Chris Murray’s very imagistic poetry, which I already love so much. The smallness and greatness of Sibyl Wren, her green den of spaces that we cannot see and her flight paths carved out in the sky. Tiny but potent and majestic in her domain. A shamanistic female bird being interpreting or bringing the mysteries of the other worldly to us. A materialisation of the invisible. A feminine nature of delicacy, strength and bravery. A guardian. An oracle seeing into the unknown and leading the reader bravely forwards through pain and difficulty. A garden world of tiny potent things. A sky above that is carved into great structures and pathways by nature that we cannot see. A fecundity and joyfulness. Spring, summer. A soaring upwards towards mystery. Invisibility of worlds around us and within us. The dandelion clock telling of another time besides the time we know. A bird shrine under a shadowy tree to the dead bird in Chris’s poem. A tiny female presence sitting and moving in an underworld of unseen unspoken spaces. Salma Ahmad Caller is an artist and a hybrid of cultures and faiths. She is drawn to hybrid and ornamental forms, and to how the body expresses itself in the mind to create an embodied ‘image’. UK based, she was born in Iraq to an Egyptian father and a British mother and grew up in Nigeria and Saudi Arabia. With a background in art history and theory, medicine and pharmacology, and several years teaching cross-cultural ways of seeing via non-Western artefacts at Pitt Rivers Museum in Oxford, she now works as an independent artist and teacher.